If you’ve used the workout editor or uploading GPX files manually you may have noticed that you can set the workout type to “Skiing”. 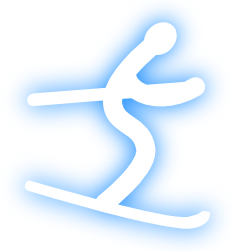 This means that you can now use SportyPal to record your skiing workouts. While none of the client applications have skiing as a selectable activity at the moment, you can set the type to “Free style” and after uploading, use the editor to set it to skiing. Setting a workout to skiing not only labels it, but also allows it to get a calorie count and a special analysis that automatically labels continuously ascending parts as paused and continuously descending parts as active. Obviously, you need altitude data for this to work properly, so if you’re uploading GPX files you should check if they show the altitude/elevation for each coordinate and Windows Mobile users should make sure that their altitude is being recorded. To check if your altitude is being saved in the Windows Mobile version of SportyPal, you should make and upload a workout of any type, then view the altitude graph on the website. If it isn’t a straight line, you’re good to go. Otherwise, go to the “My Profile” screen in SportyPal, scroll down to the “Advanced” part and change the “Use altitude tweak” option. Note that the altitude tweak option is only available in versions 1.0.9 and above, so if you have an earlier version and aren’t getting any altitude data, head on over to the download page. UPDATE: as of version 1.2, SportyPal autodetects your altitude settings. The option is still there in the profile screen if you need it for any reason, but you shouldn’t have to use it. You’ll be able to select skiing (and more) from inside SportyPal in future versions. We’ve recently added a new feature that SportyPal users have been requesting for a while now: workout editing. You can now use the “Edit” button above the workout map in the workout details view to edit any workout that has been uploaded to your SportyPal account. The workout editor allows you to add, remove and move any point in your workout. You can also change the date, time and duration of the workout, as well as the activity type. The editor will automatically calculate the average speed based on the duration of the workout. For an explanation on what the buttons in the editor do, click the question mark icon (the rightmost icon in the toolbar). You can hover over a button to learn its name. The status bar near the bottom of the screen describes how to use a particular tool once it’s selected. Note that edited workouts do not count towards your points for the community page top 10 list if their distance is increased. To leave the editor without saving, use your browser’s back button, or simply close the browser or tab that the editor is on. For optimal performance, use the workout editor from the Google Chrome browser. Any other browser should work just fine, though. Opera is known to have issues with the selection tool. If you run into any problems using the editor, let us know at the support page.